Soak up the peaceful vibe—and glorious perks—of these newer, luxury lodges. 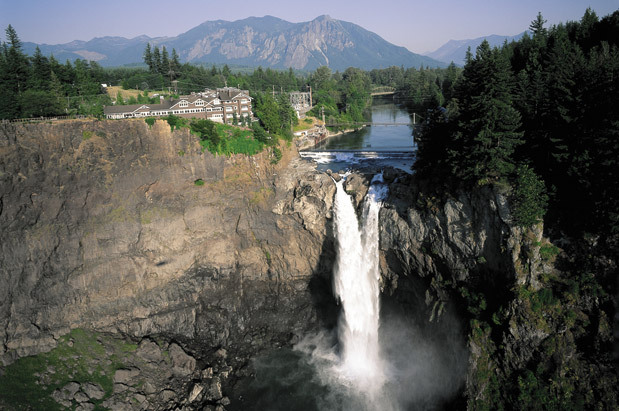 Perched above the pounding drama of the 268-foot Snoqualmie Falls, just 30 minutes from Seattle, the Salish is a favorite among romantics; many a marriage has begun here, and it’s a repeat winner on most every “best places to kiss” list. Built in 1916, the inn got a major makeover in 1988 and is now undergoing another $1.5 million luxury redo, to be finished later this year; it boasts 84 renovated rooms, each with whirlpool tub, wood-burning fireplace and feather beds. Ask for a room with a view of the falls (splurge on one of the fourth-floor suites); there’s nothing like falling asleep to the roar of rushing water, especially after a visit to the tranquil, newly renovated spa, which is replete with fireplaces, pillows and Japanese-inspired screens. Try a river-rock massage ($125 for 50 minutes) or any treatment that makes use of honey from the lodge’s own on-site hives. Then, head upstairs to the loft-like bar, The Attic, for an excellent artisan cheese and charcuterie plate ($19) and a chilled white wine, or go straight to the exceptional (and expensive) dining room for a foraged-mushroom risotto ($30) or grilled wild salmon with Salish honey glaze ($38). At sunset, stroll out to the brand-new viewing platform over the falls; the hiking trail to the bottom of the falls is closed until 2013. Open year around. $199–$399. 30 minutes east of Seattle via I-90. Snoqualmie, 6501 Railroad Ave. SE; 800.272.5474; salishlodge.com —K.R. Only in the Northwest would a key feature of a four-star resort be access to more than 40 miles of private hiking/biking/skiing trails and its own mountain lake. But luckily for guests, Sun Mountain Lodge, opened in 1968 and constructed using huge local boulders and mammoth timbers, is also known for its luxurious accommodations and spa, haute cuisine and world-class wines. Snag any of the lodge’s 96 posh guestrooms and you’ll get your very own view of the sun setting behind the North Cascades from your room high above the Methow Valley. Between the Wolf Creek Bar and Grill and the resort’s dining room, guests can savor three meals a day heavy on local ingredients. 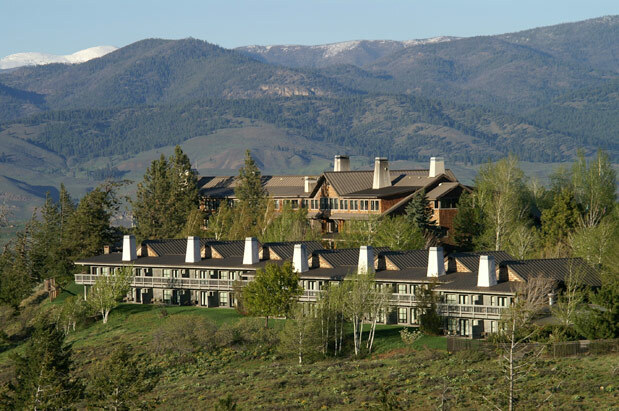 Sun Mountain Lodge is busiest during the winter holidays, when cross-country skiers rule the roost, and in July and August, when mountain bikers, horseback riders and hikers use it as a deluxe base camp to get their lead out—so book early. Nordic ski gear as well as mountain bikes (not to mention a little guidance on trail selection) and even horseback rides are available from the activity center right in the lodge’s lobby. Spa treatments and massage therapy—you may need it after tackling the trails—further pamper guests. Open year around, except for mid-March through mid-April and from late October to mid-December. $175–$460. More than four hours from Seattle in summer, more than five hours in winter (due to seasonal closure of State Route 20). Winthrop (outskirts), Washington, above the Methow Valley; 509.996.2211; sunmountainlodge.com —R.S. While most people come to the Methow Valley to get outside, nothing beats the digs at the Freestone Inn for resting those weary muscles after a hard day’s “work” fly-fishing, plying the region’s 250 miles of Nordic/bike trails or heli-skiing in nearby North Cascades National Park. (The only heli-ski operator in Washington state uses the Freestone as its launch pad into the wild and rugged North Cascades.) 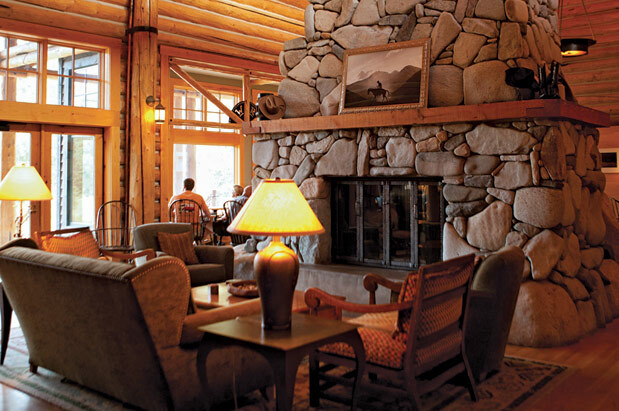 The rustic log inn opened in 1996 about 25 miles northwest of Sun Mountain Lodge, as the center of what was to be a Whistler-size vacation development, but locals concerned about the environmental downsides of growth put the kibosh on the larger deal. These days, only a dozen or so private vacation homes share the Wilson Ranch property with its centerpiece, the Freestone Inn. And most guests at the 12-room inn are glad for the peace and quiet. Each of the rooms features plush beds and bedding, high-end lodge-rustic furniture, a soaking tub and fireplace, and a private veranda or deck with a view of the Wilson Ranch’s private lake. Two of the rooms (rooms 6 and 12) feature furnished living areas, jetted tubs and extra-large balconies with panoramic views. The inn’s picturesque lake-view dining room—with its three-story river rock fireplace—features hearty Northwest dinners. Open year around, except for April and from late October to mid-November. $185–$450. Three and a half hours from Seattle in summer, more than four and a half hours in winter (due to seasonal closure of State Route 20). Mazama, 31 Early Winters Drive; 509.996.3906; freestoneinn.com —R.S. Just a 90-minute drive east of Seattle lies this treasure trove of amenities for lodge lovers who like more than a touch of luxury with their landscape. Spanning 6,400 acres on the eastern slopes of the Cascades, this sprawling new resort community is nearly half the size of Manhattan and features two restaurants, two bars, a swim and fitness center, a golf course, a skating rink, an outdoor amphitheater, shops, spa—even a winery. Book one of the 18 rooms in the intimate, elegant Inn at Suncadia, finished in 2005, and cozy up in front of your own private stone fireplace. Nearby, the less expensive (but more expansive) Suncadia Lodge, finished in 2008, has 254 rooms and suites, each of them a condo with a full kitchen. (But plan ahead; the nearest grocery store is a meager Safeway in Cle Elum, about 15 minutes away.) Either way, you’ll have access to a dizzying slate of amenities, including the impressive Glade Spring Spa, which offers outdoor saltwater soaks, rainfall showers and cedar saunas (and a luscious “sweet milk and indigenous lavender” facial, $125). Or get outside for a plethora of adventure activities, including horseback riding, boating and hiking (50 miles of trails!) in summer, and dog sledding, snowshoeing and skiing in winter. If you’re bored at Suncadia, check for a pulse; this place piles on the fun. Open year around. Inn $119–$349, lodge $99–$669. About 90 minutes east of Seattle via I-90. 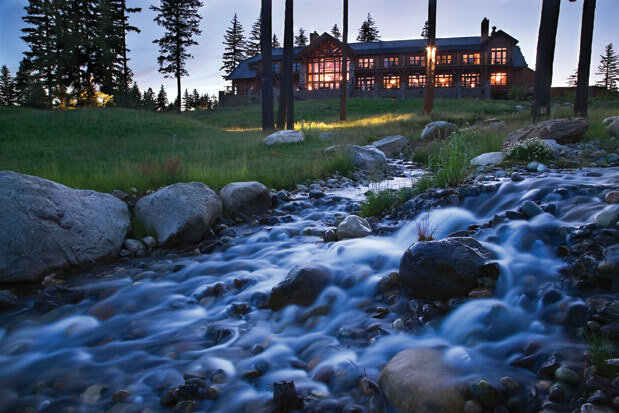 Cle Elum, 3600 Suncadia Trail; 866.904.6301; suncadiaresort.com —K.R. Located in Union on prime Hood Canal real estate, the Alderbrook Resort exudes a cozy coastal vibe; guests curl up with novels in the library, pet the lobby kitties Alder and Brook in front of the double-sided fireplace, and wander along the lapping shores while enjoying majestic views of the Olympics. Originally established in 1913, the 77-room, neo-Craftsman resort emerged from a 2004 renovation with modern updates (hey, movies on demand! ), including to the expansive spa, which features a soothing therapy pool, Finnish sauna and a dedicated relaxation room. Enjoy a sojourn in the herbal-infused steam room before hydrating dry skin with the hyperlocal body wrap using aloe, marine algae and sea brine, and topped off the hot oil scalp massage ($170 for 90 minutes); the spa also prides itself on its organic facial ($135 for one hour) and Four Elements detoxification treatment, which includes an exfoliating sea salt scrub, mud bath and then warm oil cocoon ($145 for one hour). Continue on the path to R&R by reveling in the waterfront and mountain views that spill from every window: the one from your room’s window-side daybed, perfect for cat naps; those enjoyed from the glass-encased Jacuzzi hot tub; or at your dinner table at the lodge’s restaurant. There, be sure to tuck into chef Lucas Sautter’s hazelnut tart ($10) with whipped cream and orange sauce (or one of pastry chef Boyd Borland’s other delights) and wonder why you would ever return to normal life. 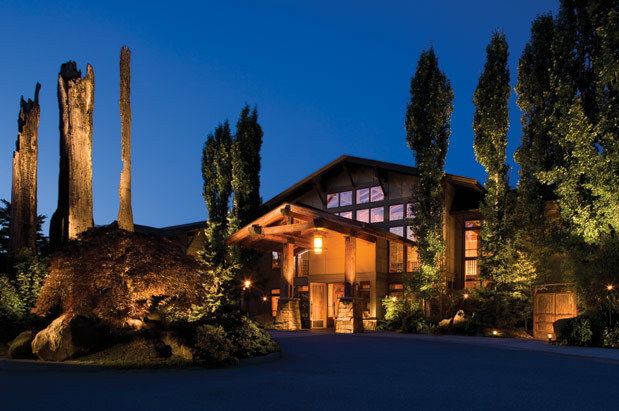 less than a half-hour drive from Seattle, the classic Willows Lodge sprawls across 5 peaceful acres set in the heart of Woodinville wine country. Created from 100-year-old Douglas fir timbers—recycled from the Port of Portland—the two-story, wood-frame building features a huge stone fireplace in the lobby, but stays on the sleek side of the rustic meter. Be prepared to be wined and dined: Located on the estate is chef Bobby Moore’s inviting Barking Frog bistro (the truffle mac ’n’ cheese will have you at the first bite); the Fireside Cellars abutting the wood-beamed lobby is long on Washington wine options; then, the pièce de résistance, the internationally renowned Herbfarm Restaurant, where a themed nine-course dinner awaits if you remembered to reserve a table (which you can do about six months in advance). Sleep off your food coma in one of the 84 guest rooms, each with its own stone fireplace and deep soaking tubs for two. Tucked into a hidden courtyard, the newly renovated Spa at Willows Lodge is the place to polish your newfound inner Zen; it boasts a new steam room and group retreat spot for manicures and pedicures. Start your spa day with a pretreatment soak in the Jacuzzi located in a private garden, then head inside for a bizarrely cool Thai herbal balls massage ($150 for 90 minutes), with your therapist massaging tender areas with aromatic cloth balls to relieve joint and muscle pain. Open year around. $199–$549. Twenty-five minutes northeast of Seattle, accessible via I-405 then Highway 202. Woodinville, 14580 NE 145th St.; 425.424.3900; willowslodge.com —K.C.